It’s been more than seven years since Michael Jackson, aka The Beer Hunter, appeared on Late Night With Conan O’Brien but we still remember how much fun that was and look forward to an appearance tomorrow (April 5) night. 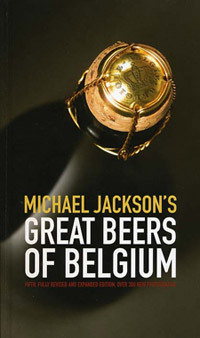 Jackson will be discussing beer (of course), perhaps whisky and certainly the release of the latest version of “The Great Beers of Belgium,” the fifth fully revised and expanded edition of the book, including more than 300 new photographs. As the last time he appeared on Late Night, Jackson will be taking beers for O’Brien to taste. Look closely and you might catch a glimpse of the first labels for the Lost Abbey brand from Port Brewing, including one for Avant Garde. where is the latest book published? I can’t find it on amazon.com or BN.com? The book doesn’t have a U.S. distributor yet. If you click on the link at the top of beerhunter.com there is an offer for the book (that banner will likely expire).